Former residents made their way to the evacuated town of Sa-Nur overnight, but were intercepted by police and army forces. Hundreds of Jews made their way overnight to the ruins of Sa-Nur, one of the four Jewish towns in Samaria destroyed as part of the 2005 Disengagement. But the group, which included dozens of families of former residents of Sa-Nur and the neighboring community of Homesh, was intercepted by Israeli police and IDF forces, who aborted the planned visit. The former residents, joined by friends and supporters, had intended to celebrate Independence Day in Sa-Nur, a bittersweet memorial for the now destroyed community. Those making their way to the ruined town, however, found their path barred, with police roadblocks shutting down access to the site of Sa-Nur. Police patrols along alternative routes prevented members of the group from making their way to the town by foot. 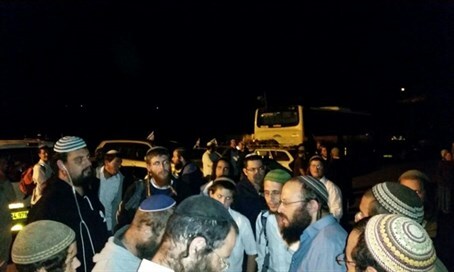 MK Bezalel Smotrich (Jewish Home) who had joined the delegation on its way to Sa-Nur, praised the former residents and echoed their calls for renewed settlement of the area.